The soonest the event could return to Salt Lake City is 2023. 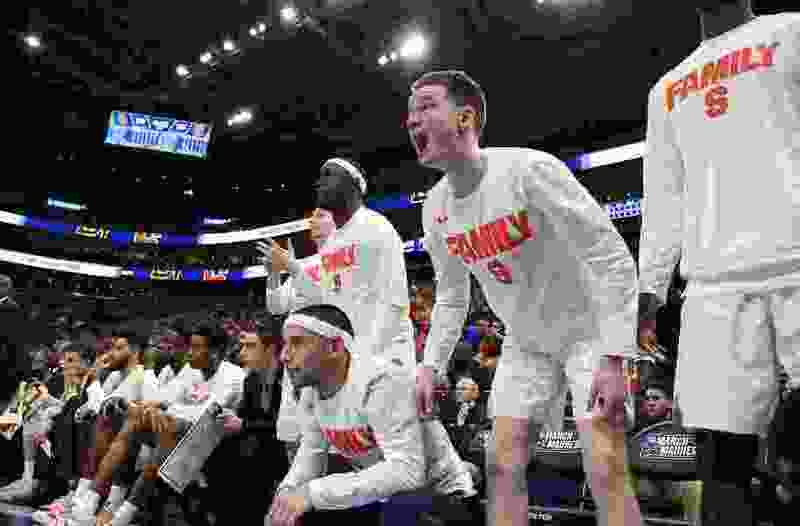 (Francisco Kjolseth | The Salt Lake Tribune) The Syracuse bench cheers on their team as Syracuse faces Baylor in their first round menÕs NCAA March Madness tournament game at Vivint Smart Home Arena in Salt Lake City on Thursday, March 21, 2019. The basketball team's bus parked in the loading dock of Vivint Smart Home Arena for an NCAA Tournament practice session. Staff members walked into the building with their standard equipment, including Gatorade coolers. The Bodyarmor sports drink company has the NCAA contract, so the coolers quickly were replaced. That's just one illustration of the issues that Steve Pyne has prepared himself to address every day for nearly six months, right down to the branding of towels and deodorant in the locker rooms. The University of Utah is hosting the tournament for a 20th occasion in 52 seasons, partnering with Vivint’s management for a fourth time in this decade. What’s the benefit to the school? Money, with a projected share of more than $200,000 based on the 2017 revenue, Pyne said. Brand promotion, with Ute logos in the corners of the court and signage in front of the press row. And other exposure, with the broadcasters making the connection of Salt Lake City and the university. It is a major undertaking. In contrast to Saturday’s Pac-12 Gymnastics Championship at the Maverik Center in West Valley City, where the conference staff is largely responsible for staging the meet, Utah’s athletic department is heavily involved in the basketball tournament. “It pretty well consumes my life for about five months,” said Pyne, Utah’s director of event and facility management, who’s assisted by media coordinator Mike Lageschulte. The compensation goes far beyond the Utes' share of the revenue. The money alone wouldn't make all of the department's effort worthwhile, Pyne said. The value is in the experience of staging the tournament for roughly 70 staff members and volunteers, and being part of what has become an iconic sporting event. All of the college basketball blue-bloods have played in SLC during the NCAA Tournament, except one. Here come the Kansas Jayhawks. The tournament “just gets bigger and bigger and bigger every year,” Pyne said. While preparing a bid that resulted in Utah's hosting the 2010 West Region finals, he recognized that the event had outgrown the Huntsman Center, in terms of suites and operational facilities. So the Utes have partnered successfully with the Jazz's arena. The NCAA uses a four-year bid cycle; the 2017 tournament came near the end of one calendar and this year's tournament is at the start of another. Utah's 2019 bid was enhanced by the 40th anniversary of that Magic Johnson-Larry Bird Final Four, explaining the quick return to Vivint. The soonest the event could comeback to Salt Lake City is 2023. When the Kansas-Auburn game ends Saturday night as Pyne watches from a front-row seat, he will be hit with the dueling emotions of being done with an intense phase of his life, while knowing he won’t get to do it again for at least another four years.